Evaluating players is a tough thing to do, just ask the scouts. Here at FantasySP we evaluate thousands of players algorithmically based on a variety of factors. Our process is not perfect and has continued to evolve over these past 5 years. As of yesterday a major update went live to baseball player ratings. 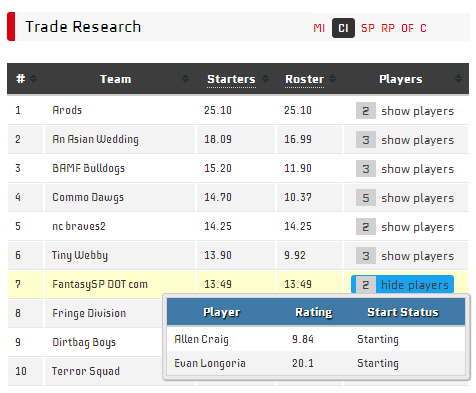 You may have noticed that Rankings/Ratings inside the Fantasy Assistant have changed as a result. I wanted to take a moment to talk about player ratings and give you inside insight on my thought process and what our latest update means. FantasySP has a wide variety of tools and all of them rely on accurate Player Ratings, often referred to as FSP. Needless to say, it is important that our ratings are as accurate as possible. Over the years player ratings have gone through countless updates to further improve accuracy. Yet I still felt that they were still missing something. Then, a conversation over at the /r/fantasybaseball subreddit with Capper22 finally made things click. So well said! Let’s do just that. Before we get to improving player ratings, let’s take a step back and go through a list of questions you might ask as yourself when evaluating a player. Then, I can compare this to what I have already implemented and see where the problem might be. Historical stats. How has this player performed over the past two or three years? Current Season. How has this player performed this year so far? Comparisons. How does this player compare to other players at the same position? Injury Situation. Is this player healthy? Trending Stats. How has this player performed in the past 30 days? Upside. How much upside or downside does this player have? Expert Opinions. What do the experts across blogs, newspapers, and fantasy sites say? If you noticed, all of the questions that go into evaluating a player have almost nothing to do with fantasy scoring or fantasy leagues. Kind of odd for a site called FantasySP, right? Well, fantasy scoring is essentially another way of repackaging what the raw statistical data already says. Since leagues could have different scoring, it makes more sense to look at the raw data rather than customized scoring systems. So that is where I look first. After taking these questions into account I felt that my core player rating logic was still sound. Part of the problem is that I was over emphasising Trending Stats. This was one of the factors that lead to guys like Jarrod Parker being rated better than Yu Darvish. Without getting too technical and give away too many secrets… I rewrote some of the logic that looks at trending stats. I also took a closer look at how I factor in historical stats as well. What we are left with are more accurate player ratings. Another evolutionary step forward. Many of the updates I made to baseball will also be applied to football, basketball, and hockey over the coming weeks. Is it perfect now? Well, no. Which brings me to the Dodgers picture that is included with this post. 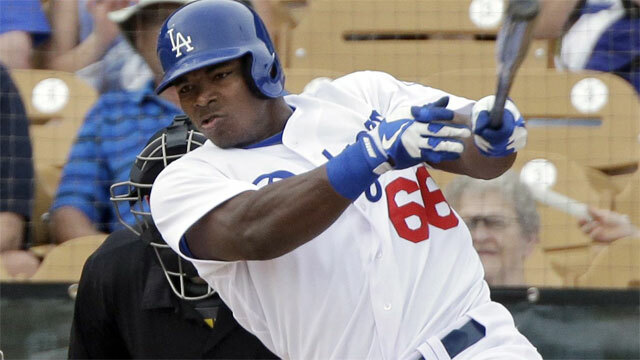 As you might of guessed, that’s Yasiel Puig who is off to a hot start to his career. He is also a reminder that evaluating rookies is hard and that player ratings will never be completed. The Trade Research Center exists within the Fantasy Assistant, and is a feature that I alluded to in my previous blog post about position based analysis. This new tool will allow you to easily research various trades and even receive personalized trade suggestions. The development of this feature was heavily influenced by users of FantasySP with testing and/or suggestions by Michael, Steve, and Rob. The Trade Research Center is based off of the position ratings that were released two months ago. It consists of three separate areas: Position Ratings, Research Area, and Trade Suggestions. Position based ratings show you where various positions on your team rank against other teams in the league. This is slightly different for each sport, but works exactly the same for all sports. 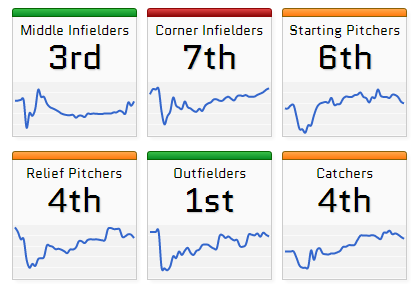 We also chart each team’s data on a daily basis so you can easily see where you are trending. The ratings are generated based off of the average of your player ratings for each specific position grouping. Based on what we see on the right, it appears that I have a fairly balanced team. My worst position is Corner Infielders, but not by much. The blue line for each box indicates the current trend of my players. For the most part, all positions are gradually improving over time. Any time you see a big spike or dip, it generally indicates a waiver wire move that was performed on my part. The research area of the Trade Research Center allows you to delve deeper into what other team’s look like. You can see all the teams in your fantasy league and see exactly where they rate and rank in each position. It also shows you the depth of each position. To start with, let’s look at the Corner Infielders position and see why this tool is helpful and what you can do with the data. Based on the screenshot to the right, I am currently ranked 7th of 10 teams in my league. Based on the Starters rating, I am 12 points behind the top team. Clearly my Corner Infielders need help some help, so let’s try and develop a trade based on this need. The top team, Arods, only has two players and they are the best in the league right now. My chances developing a trade with him may not be in my favor. Instead, let’s focus on the 2nd ,3rd, 4th place teams. All of those teams have more than 2 position players, so we know they have a surplus. That may work in our favor. The other key ingredient for a trade is to be able to fill a need of another team’s weakness. Outfielders just so happen to be my strongest position, so the goal here is to give up an outfielder to help bolster my Corner Infielders. BAMF Bulldogs and Commo Dawgs are in desperate need for an outfielder and are ranked 9th and 10th. There is no question that I should narrow down my list of teams to them and see if a deal can be worked out. But what if I don’t want to do all this work researching? What about automatically suggesting a trade based on this type of data? We’ve got you covered for that in our Trade Suggestion area! As I stated in the previous area, we’ve already narrowed down the choices of teams to trade with. If this feature works as advertised, then it should be selecting BAMF Bulldogs or Commo Dawgs. Right now the Trades that are suggested involve team BAMF Bulldogs. Getting Edwin Encarnacion and Desmond Jennings would be nice additions for the right price. You can click on the “view analysis” button to view more information such as latest player news, graphs, and player breakdowns. This works exactly like Waiver Wire Suggestions. So the real question is, are these trades helpful in any way? These trades are listed as in our favor by 100% and are certainly in the ballpark. I personally do not think my opponent would accept the first trade for Josh Willingham and Allen Craig, but it can’t hurt to propose it? 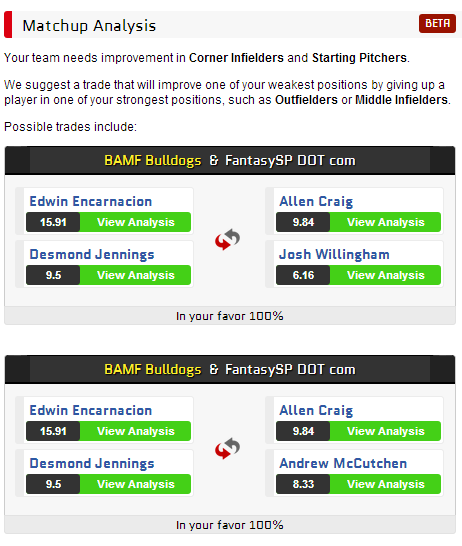 As for the second trade, giving up McCutchen and Craig to get Encarnacion and Jennings is a bit too much for me. I would, however, consider giving up David Ortiz since I know that he can be played in the Utility spot and may not keep up his current pace. In any case, I can go on and on here about potential trade scenarios but I think you get the picture. You can see how quickly and easily I can come to a trade by doing a bit of research with our new tool. I can easily pinpoint their strengths and weaknesses as well as my own. I also get trades suggested to me that I can use as a starting point. This feature will work with all major fantasy sports including NBA, NFL, MLB, and NHL. Right now I still consider this feature to be in BETA so expect there to be changes down the road to further increase its accuracy. Go ahead and sign up for FantasySP and enjoy a free trial to gain access to the Fantasy Assistant. Update 5/11/2013: The CBSSports App now has this feature as well. A major update just went live on the Fantasy Assistant involving position based analysis. I wanted to take a minute to talk about why it’s important and what it means down the line. As of today, version 1.0 of position based analysis is live on the site. Expect lots of improvements moving forward, but for now your screen should look similar to the screenshot to the right. 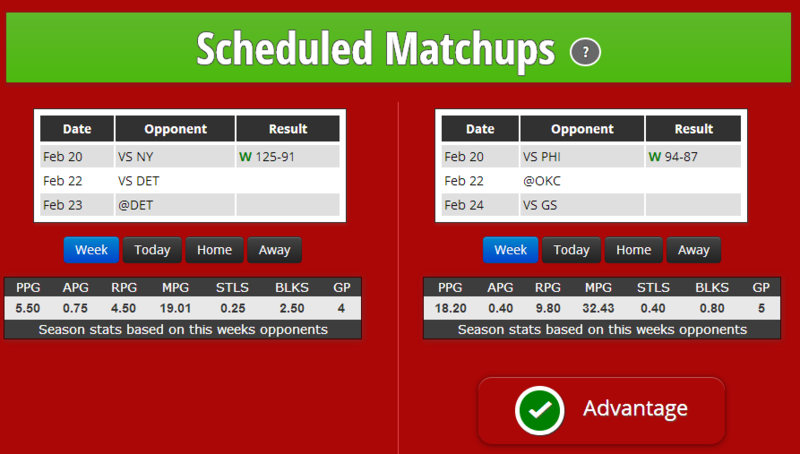 The picture you see on the right is based off my fantasy basketball team as of March 13th 2013. My team is broken down into Guards, Forwards, and Centers. Each sport will have their own unique positional breakdowns. Baseball and football will show six total categories. Hockey will show four. The second thing you’ll notice is the blue line underneath each ranking. The blue line shows how that position rating has changed over time. Each day we calculate position based analysis for your team and every other synced team in your league. Ideally you would like to see the graph trending upwards. A graph trending upwards means that your ratings are increasing. In my particular case it looks as though all of my position ratings are going down. Needless to say I am in some serious trouble here. As you may or may not know, we already provide team by team analysis based on starting lineup and full roster. With the addition of position based analysis we are now able to show you key areas on your team that need improvement. You can also browse to other teams in your league to see their strong and weak spots. This new feature is ONLY available to paying members of the site (or our CBSSports app). If you are interested in trying out the fantasy assistant then sign up now for a free 7 day trial. Position based analysis is an important step towards a new feature that is coming later this month. I can’t reveal what it is quite yet, but I will say that it is the most requested feature by our users. I decided to break things down into two separate updates because position based analysis is awesome in its own right. Setting your fantasy lineup is one of the toughest decisions to make on a daily or weekly basis. I recently released a suite of start/sit tools to help with deciding one of two players to start or sit. These tools are available for the MLB, NHL, NBA, and NFL. Each start/sit decision is broken down into different categories such as Own/Sit percentage analysis, performance analysis, FantasySP player rating, expert consensus, and more. The tools are good, but I want them to be great. The next evolutionary step with the start/sit tool is to include scheduled match-ups for the fantasy week. For the NFL, it showcases the defensive match-up for the week and shows where the defense ranks for points per game and how well they do against the run or pass. This way if you were on the fence between two players, the one with the easier defensive match-up might be the deciding factor. But what about hockey, basketball, and baseball match-ups? All of these start/sit decisions involve playing multiple opponents each week. A lot of thought went into how match-ups work for these sports and I wanted to share how it works. 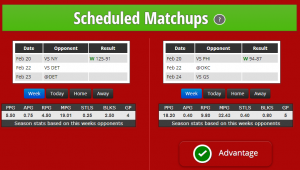 The scheduled match-up section shows you the current fantasy week’s schedule, along with any final scores for games that have been completed. Underneath the schedule are 4 buttons: Week, Today, Home, and Away. By clicking on “Week” it is showing you his stats based on all games played this season against these specific opponents. The same is true for Today, Home, or Away. It is critical to understand various match-up scenarios before setting your lineup. This tool finally allows you to see that match-up data in real-time without having to do the research. This tool is great for both weekly fantasy leagues or a daily leagues. For this particular example we will be looking at a weekly match-up between Roy Hibbert and Nikola Pekovic. (If you would like to follow along with up to the minute data, then sign up for the site to get a free weekly trial. You will have full access to ALL of the tools during the trial). According to this week’s schedule, Nikola Pekovic has played against the Sixers, Thunder, and Warriors a total of 5 times and has posted slightly above average numbers compared to his season totals. Right off the bat we can expect Pekovic to post average or possibly better numbers this week based on his opponents. On the other hand, Roy Hibbert has played 4 times with terrible numbers this season against the Knicks and Pistons. Right away we can see that starting Hibbert is a very risky play by just looking at the match-ups. Let’s take this a step further and look at home away breakdown. Pekovic is the better play regardless of whether he is on the road or at home. His tends to post similar stats whether he is on the road or at home. Bottom line? He’s a safe start across the board. However, what’s interesting is that Hibbert tends to play slightly better at home, so if you were to start him, your best bet would be for home games. This particular week he is on the road for two of those games. There are no games scheduled for today, but you can get a feel for why this tool can be extremely useful. The start/sit tool rates Pekovic as a Start with 80% certainty. Sounds about right to me? There are more enhancements coming for scheduled match-ups. With baseball quickly approaching expect to see VERY useful match-up analysis. Baseball, more than any other sport, is all about stats. Let’s say you are deciding between two different hitters. Wouldn’t it be great if you could see this week’s probable starters right inside the tool? Even better, how about the combined ERA, WHIP, and W-L record of this week’s probable starters? All of these stats, which are hard to research, will be presented to you without any effort on your end. I am extremely excited to release this new addition to the start/sit tools and hope that you guys find it useful. Expect to see these features and more down the road for the entire suite of Start Sit Tools. These tools will also be available in the CBSSports Fantasy App store for easy access. For everyone else, use them right here on FantasySP. As always, any comments or questions be sure and let me know. After all, this tool was developed because you wanted it. Who to start is the one question that plagues many fantasy owners on a weekly basis. 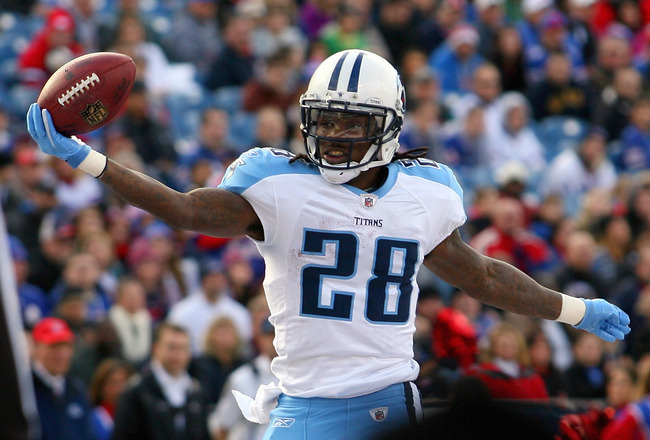 Picking the wrong guy can cost you a fantasy victory and potentially, your season. There are various fantasy experts to ask, fantasy rankings to analyze, tools to purchase, and tv shows to watch. So what’s the best way to figure out who to start? As you might imagine, I get many emails asking for fantasy advice and it’s impossible for me to respond to everyone. Each time I am asked who to start I tend to give the same response: Do your research. I am not a huge fan of fantasy experts (eek, that sounds bad). What I meant to say is that fantasy experts can be wrong too. Do not focus on fantasy point predictions each week. After all, who knew A.J. Green would be the leading wide receiver this season with Andy Dalton as a solid fantasy quarterback? Do your research means to read up on as much news as possible about your players and the team. If your go-to starting running back or quarterback is in a slump, then perhaps it’s time to pull the trigger and start your backup. Tough start/sit decisions are what makes fantasy football fun. When Matthew Stafford has a tough match-up, you better have a contingency plan. There may be those of you who base your start/sit decision on expert rankings, or aggregated rankings, or fantasy tools with start/sit advice. On the surface those may sound pretty appealing. However, does learning that Chris Johnson has an average rank of 5.1 or that Matt Forte has an average rank of 4.6 help you? Do you really want to base your start decision on a fantasy tool instead of your own gut instinct? I think these options are good for first year players, but seasoned veterans should know better. The best way to decide who to start is to do your research. There is a reason why FantasySP collects and organizes news the way it does. The reason is because that is the key to success. Reading a fantasy update at ESPN.com or CBS is just one summarized opinion. I suggest going a step further. Read up on the news from beat reporters like Susan Slusser, and make sure to read Peter King’s Monday Morning Quarterback. These articles have nuggets that you just can’t find anywhere else. FantasySP helps get you to where you need to go. Sometimes, even when you do your research and pick the right guy for all the right reasons the other guy has a great week for all the wrong reasons. You know what I call that? Fantasy football. Sometimes it’s better to be lucky than good. Author Brant TedeschiPosted on October 27, 2012 October 27, 2012 Categories fantasy pointsLeave a comment on Who do I start?